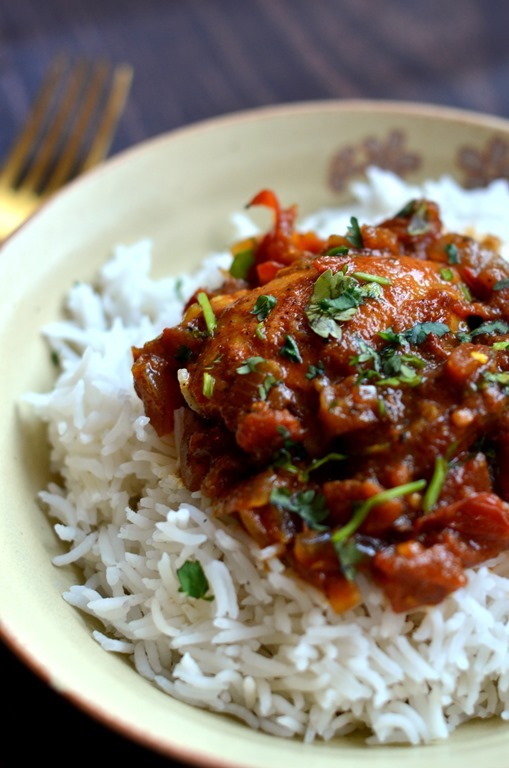 The most simplest and easiest Chicken Curry that can be made!! Yes. 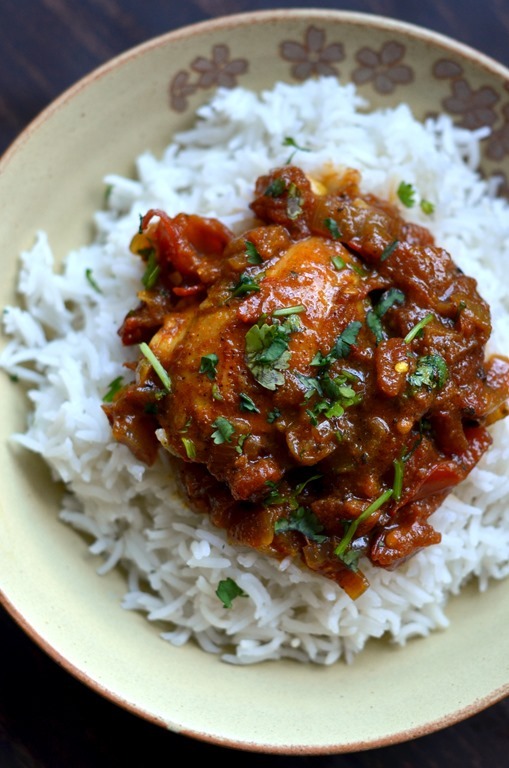 This is one of the easiest and simplest way to make a very flavorful and fragrant chicken curry. And No. It does not have any “curry powder” in it. The flavor comes from a very careful blend of spices and ginger and garlic and some of the tanginess from the tomatoes and a hint of a sweet taste from the almost caramelized onions. If it does sound complicated to you, don’t worry, it is not at all that complicated to make. You can be done from start to finish in about 30 mins. And there is not much possibility of messing this up either. Just keep checking the seasoning as you go, so you don’t make it too hot or spicy or salty than what you would want it to be. My first chicken curry that I made (remember, I am a vegetarian and have always been one all my life) was something very similar to this. And it turned out pretty decent, inspite of never even having eaten chicken or made anything with chicken or any form of meat ever. Ok, I think I have now established in some form or the other that this really is a simple recipe to make and that you should definitely try making it. And yes, of course, let me know how you liked it. Or not. I am pretty open to feedback, that way and would love to hear either side of the stories. That helps me bring better recipes for you guys. Crush together ginger, garlic, cardamom, cloves, black pepper and cinnamon in a mortar and pestle to form a coarse paste. Heat the oil in a wide bottomed pan and add the onions to it. Add the spice mixture too and let it sauté on medium – high heat for a few mintues till the onions start to soften and brown a little. Now add the tomatoes and sauté till the tomatoes are soft and mushy. Throw in the turmeric, coriander and cumin and the salt. Add the green chilies now if you are using them. Mix well. Add the chicken pieces and the water and let it cook over high heat for 10 mins or so till the chicken is done. Add more water if needed. 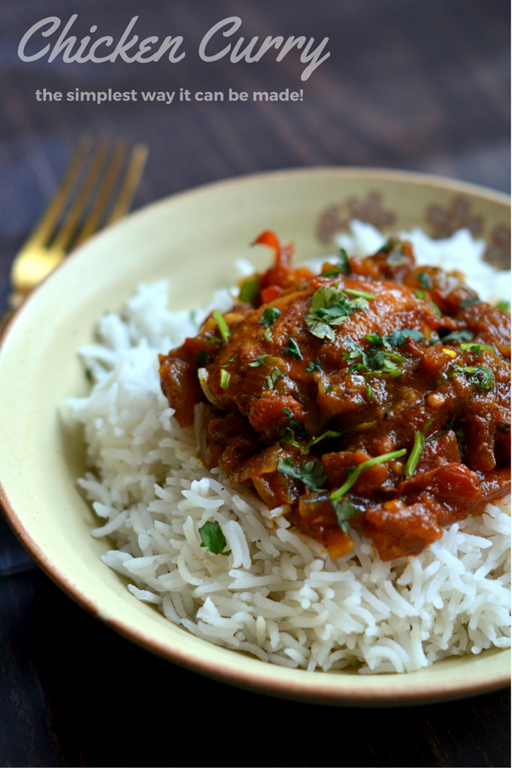 Garnish with minced cilantro and serve over basmati rice or with chapatis or naan. 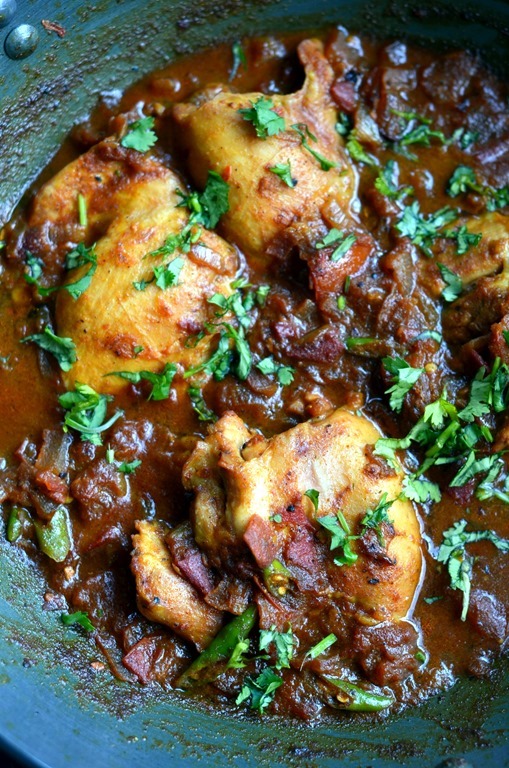 First time commenter and looking forward to making this chicken curry in a few days. I have just one question: the green cardamom, “deseeded and pod discarded” that the recipe calls for… maybe I didn’t understand this right, but what part am I supposed to use if I discard the pod & remove the seeds? Should I use the black seeds inside? I know it could be confusing. What you need to do is remove the black seeds from the pod and use the seeds. You could use it as a whole too but the pod can get a little chewy and get in the way of a delicious bite sometimes and some don’t enjoy it. At least, I don’t. Hope you love the recipe ?